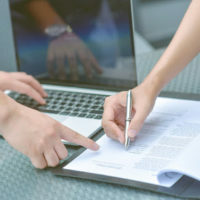 When a couple is considering a prenuptial or postnuptial agreement, it’s common to worry that somehow it will diminish or interfere with the quality of the relationship. In most cases, the opposite is actually true. A prenup is simply a contractual agreement between two people, usually drafted by an experienced family law attorney, setting forth a mutual understanding of what would happen in the unlikely event of divorce. A prenup gives a couple some certainty and understanding from the outset. Now, it’s also true that a prenup is not warranted in all marriages. A young couple marrying in their early 20s with no assets probably has little interest in writing up a contract. However, there are a few circumstances that practically demand advanced planning. And even if you’ve already wed, a postnuptial agreement can be used to set forth an understanding of what would happen if things went south. Here are just three specific examples of situations that definitely call for a marital agreement. Perhaps the most common example is a second marriage, especially with children by the prior marriage. Here’s the reason why a prenup can be crucial. Maryland is an equitable distribution state. Under Section 8-205 of the Family Law Code, Maryland law says that when two people divorce, all of their marital property is subject to the judge’s determination of what is fair and equitable. Maybe some people trust the stranger in the black robe to know what is fair and equitable, but a growing number of people (many of them millennials) would prefer to decide this for themselves in advance. Imagine a woman who amassed a significant amount of assets during a first marriage. Her husband dies, and she later re-marries a man with very few assets. Psychology Today suggests that the risk of divorce increases with each subsequent marriage. Once funds and property are commingled (meaning mixed together), they become part of the marital estate. In our example, if the woman combines her own funds with her new husband’s funds, and they divorce, even if the marriage was fairly short, the new husband could stand to receive a windfall. Worse yet, the woman could end up losing a lot of the funds she worked so hard to amass earlier in life. With some exceptions, those in highly visible public positions, such as celebrities and politicians, should probably consider a prenup or postnup agreement. While we all want to believe that our spouse has chosen us because of love, the sad reality is that this is not always the case. Some people are simply very effective at seeking out marriage as a lucrative way to profit from someone else’s success. A prenup forces the spouses to prove that the marriage is about love, not money. It may not be romantic, but it just makes sense. A lot of people face marital troubles at some point in their lives. Marriage is tough. Fortunately, many people survive their troubles and make their marriages work, even after devastating situations. Consider a situation where one spouse is unfaithful or leaves his or her spouse for a lover. While this can be a challenging situation, many couples seek out counseling and find a way to reconcile and save their marriage. While admirable, a prudent person who has suffered this type of situation may wish to ask the unfaithful spouse to submit to a postnup as a condition of reconciliation. In some situations, it can be an agreement that the couple will maintain for 10 years and agree that they will mutually void the agreement after a certain point in time. Maybe it is just used to ensure that the wandering spouse is choosing to stay in the marriage for the right reasons and not just for money. Whatever the reasons, a postnup can be very effective in negotiating a reconciliation, if used under the careful guidance of a compassionate and experienced attorney. Legal issues can be dizzying for those who are suffering through a divorce, reconciliation, or contemplating a late-life re-marriage. With offices conveniently located in Glen Burnie and Columbia, the Law Offices of Todd K. Mohink, P.A. makes it easy to get the answers you need. Contact us today to make your appointment.